^^ I couldn’t have said it better myself! 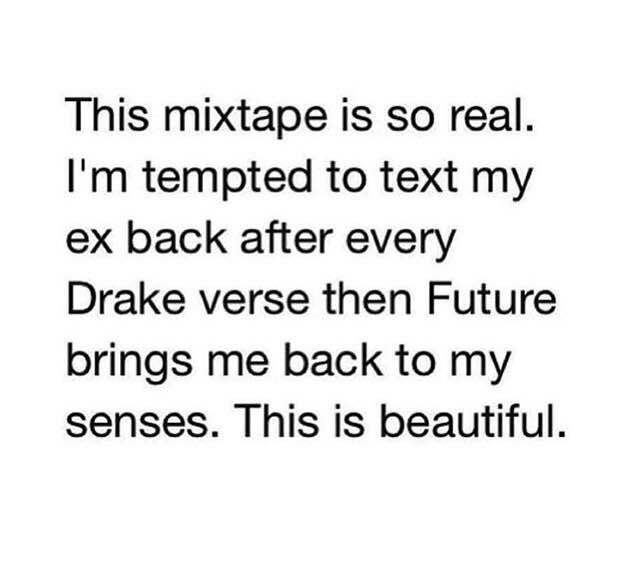 The new joint mixtape from Drake and Future, What A Time To Be Alive, has got me feelin’ all types of ways right now! Drake has been a favorite of mine since Day 1 and ever since I saw Future perform at his DS2 fan party in NYC I became even more intrigued with him as an artist just by seeing how hype he was on stage and how much love he showed for all his supporters-his energy was contagious! I would have never expected a full on mixtape from Drake and Future but after listening to it I can’t believe I couldn’t imagine it before. This duo compliment each other so well. “Diamonds Dancing,” “Change Locations,” and “30 for 30 Freestyle” are my top picks off this 11 track project. 6 days spent at the studio in Atlanta and this was the result…SHEESH!